Part of the struggle of our dish collection is that my job requires me to have a variety of dishes in all different kinds of colors, shapes and styles! So ‘simplify’ doesn’t work so much in this case. Although I do donate dishes that I don’t love – like a bowl with a color that makes food just look blah. My goal when unpacking our dishes into our new home in Charlottesville was to group like with like. We used to group bowls with bowls, but this time like with like applied to style too. The biggest lesson for our current dish configuration is to get the majority of the dishes OUT of the kitchen and into the dining room where we have more space. The kitchen is packed full enough with cooking equipment and food, so by putting most of our dishes in the dining room, we’re able to keep our cabinets neat and open. 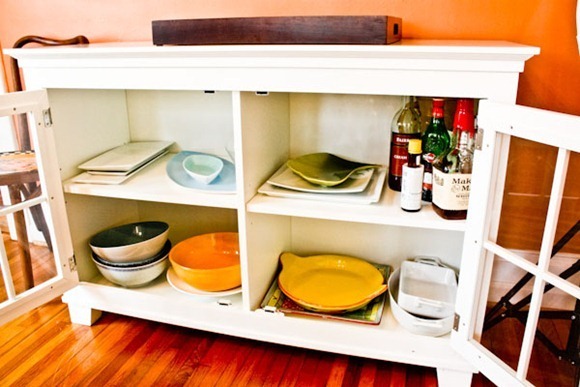 There are so many creative ways you could house dishes – from open shelves to chest of drawers to TV stands. Don’t forget they make pretty decor! By the way, our everyday dishes and flatware are Pottery Barn’s Great White line (although the square plates are a custom set that Karen got us). I opted for a really great white set over fancy china when I got married and think that food looks best in white dishes! 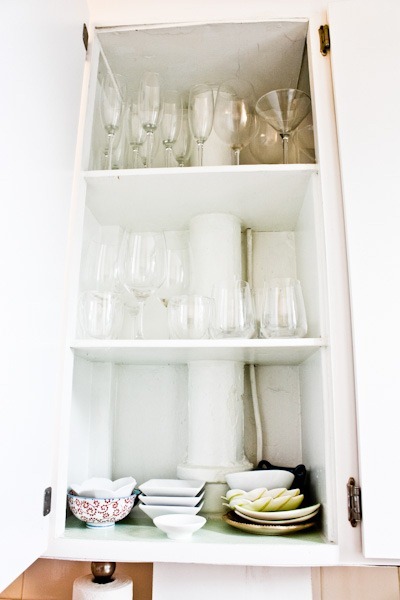 And all the glassware goes in the upper cabinet that is hard to reach – since it’s not used everyday. It used to take up precious eye-level china cabinet space, but now it’s tucked away. Small bowls also have a place on the bottom shelf. With that pipe in there these shelves couldn’t fit bigger dishes, so putting skinny glasses and small bowls worked really well. 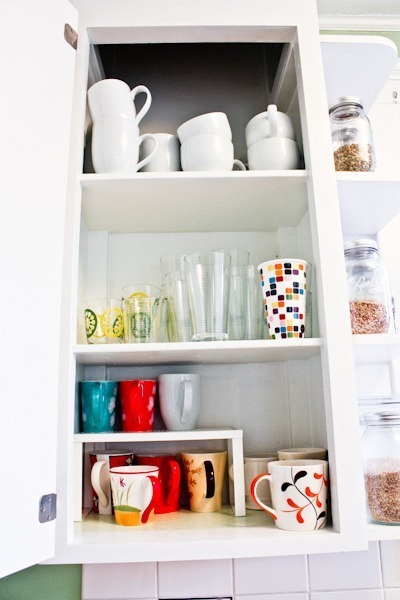 The last upper cabinet in this kitchen houses all cups and mugs. Thankfully they all fit! The little IKEA shelf helps a lot too. I could use another one of those! This matching glass-front cabinet used to be our TV stand, but here in Cville it works better as a dining room buffet. It’s also from Crate + Barrel! It holds all of our large bowls and servingware. Someday I’d love to have a dining room with a whole WALL of shelves that I can use to store all of my dishes – and get some more of my mom and grandma’s china out for everyday use! 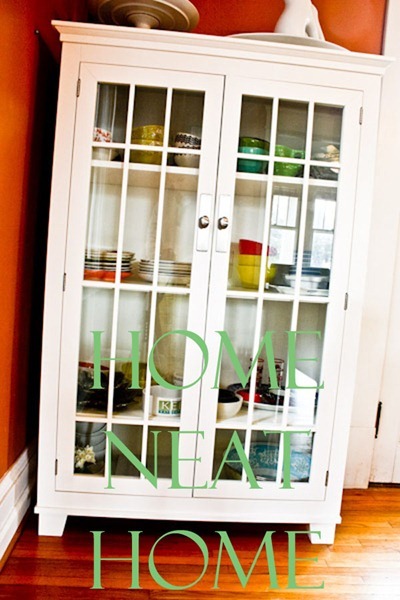 See the rest of our kitchen in use in the Home Neat Home: Kitchen edition! I’m hoping to have a room just for my dishes one day! LOL I have sooo many, and sooo many still in storage! <3 dishes! How much fun would it be to have a wall of built in shelves with one of those rolling library ladders?! I was curious about how you stored your many bowls. I have everything in the kitchen now (we live in an apartment under 600 sq ft) and I have come to the conclusion that I need to get some stuff out of the kitchen at this point if I want to buy anything else. Love this post! 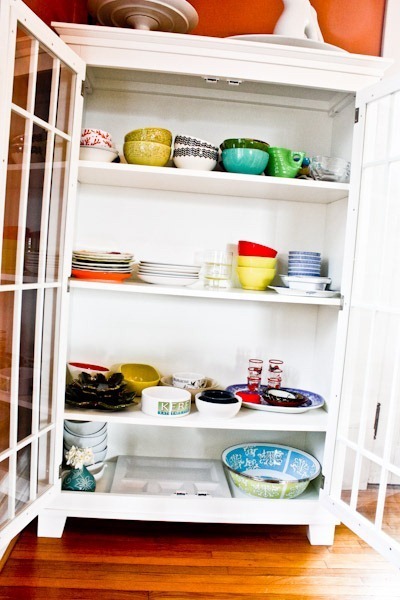 I think having the colorful dishes out of the kitchen cabinets is a great idea! Looks great! I desperately need another dish cabinet/buffet to house all of our dishes/servingware. I dream of the day when I will finally have a kitchen with enough cabinets to hold all my stuff! I really love your white / glass cabinet! You have one of the best dish collections I’ve ever seen Kath!! 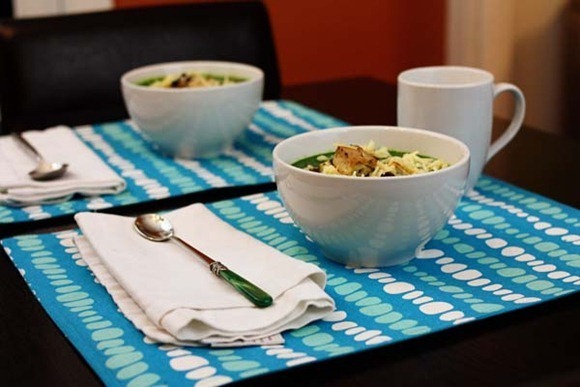 I love the whites against your table mats, but love your other fun bowls and plates too. I need another cabinet for all of the random bowls I’ve been acquiring lately! Ugh– I need to get my dishes UNDER control!!! They are all over the place in our kitchen! You could be a professional organizer. Thanks as always for the inspiration. Agreed – my plates are Pottery Barn white – and I love them! I agree- food definitely looks best in white dishes, unless of course, the food is also white. Then, you need a color pop. We don’t have enough cabinet space for dishes in our tiny DC apt, so we use an old, very tall book shelf to hold the dishes. We have a Royal Doulton set (mixed light blue and white) which I love and looks gorgeous on display. It also makes the dishes easily accessable and saves space. Using the bookshelf was the perfect solution- practical and pretty! Will you please come organize my house? I am so impressed by how neat and organized everything is at your house. 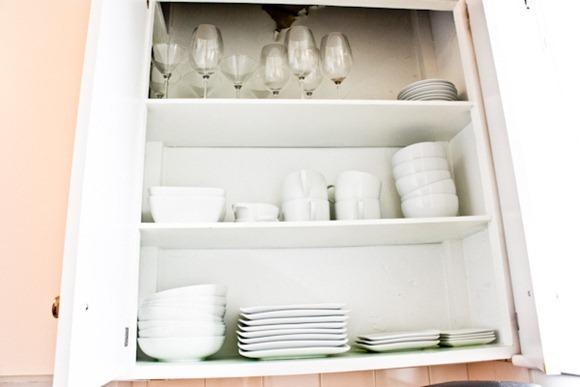 My house always looks neat, but if you open the cabinets you will find LOTS of clutter. A wall of dishes would be really cool. I love that open look, too. Very European. I really like dishes, and would love to collect some if my husband and I would ever stop crisscrossing the country on big moves! I have the great white collection! well I have the bowls and the round plates and I love them! I agree food looks best in them! We have an old set of dishes (that I like but are just ok) — I would love to get a nice set of white dishes because I agree food looks best on white! No!!!!!!!! Surprisingly I didn’t ! Awesome. This year I have two roommates, so the kitchen is pretty mix-matched to say the least. I LOVE this series, though, because it’s giving me a lot of ideas for next year when I’m with my to-be husband! 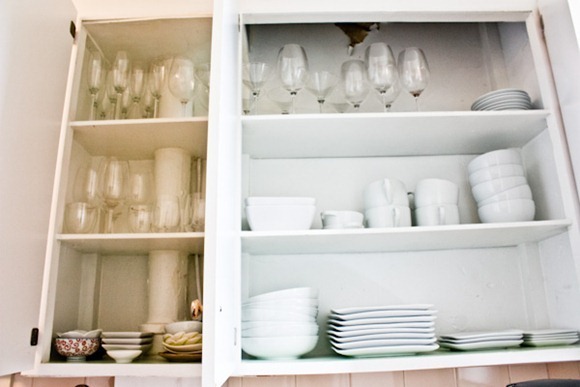 As with most everything on your blog, your dish organization is impressive and beautiful! ohh how fun! except the thought of having these in my home would be chaos simply b/c my mother would kill me! I buy one extra bowl and it’s lecture time. And I’m 23. hhaaaha it’s b/c we have so many people in one household. 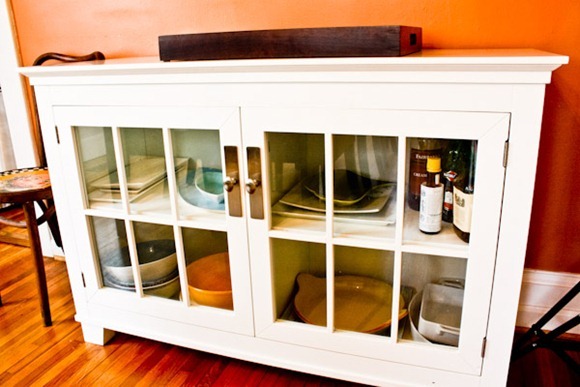 I love that idea of using a TV stand for dishes…so creative and so practical! BTW, I have something for you at my blog. Sorry, but I had to!!!! Love all of the open space! 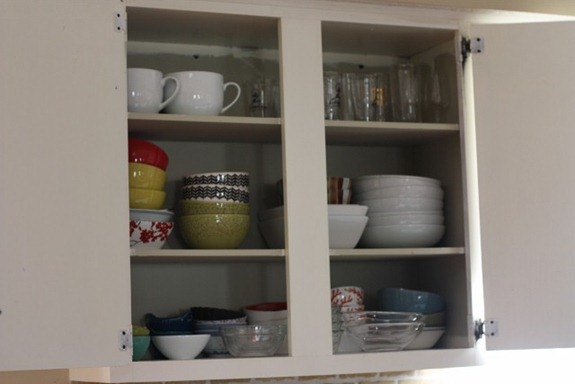 Especially your bowl cabinet– what a fun and cute idea. I agree about photographing food in/on white… looks so nice! I love your collection and how you store everything. The white dishes really do allow the food in them to POP, so to speak, and that’s awesome. I love the white dishes too. Fiestaware is always fun to mix in with it. They have alot of great colors. Haha – I have that first C&B cabinet in black. I really like how “clean” their furniture designs are. I love your dishes collection. I made an odd choice when I got married and went with Pottery Barn yellow. Wish I would have gotten white, so much more practical. The yellow is pretty, though! I also have a white cabinet in the dinning room which holds my dishes. I use it for my vintage Pyrex collection. My everyday dishes also are white. I need to organize better..you have the most beautiful dishes, Kath!! If you ever want to donate pretty dishes, I’d gladly take them 🙂 Such beautiful colors! I LOVE fun dishware! before i even knew about food blogs, i had a crazy collection of bowls and mugs that drove my mother crazy. the bowl collection hasn’t gotten too much worse, because i know there is practically nowhere else to sneak them into the cabinet. but the mugs, i’ve been in love with since probably before high school. i cannot help but buy a new wonderful one whenever i travel somewhere new. or design one at a make-your-own-pottery. or find one at a garage sale. i might have a problem. i feel ya Kristen. I love to buy mugs for every holiday 🙂 and I can ONLY use them during that time of the year. Your ability to be organized is impressive. Did you know that it is quite Zen for each person of your household to have their own cup that matches their taste/personality, they should not match. Same could be said for bowls. You could always be more economical and green and purchase used bowls from Thrift or Goodwill stores. Love your site. OMG, I love C and B! I would live there if I could! I concur with you 100%–I would choose plain white dishes over any fancy china any day of the week! 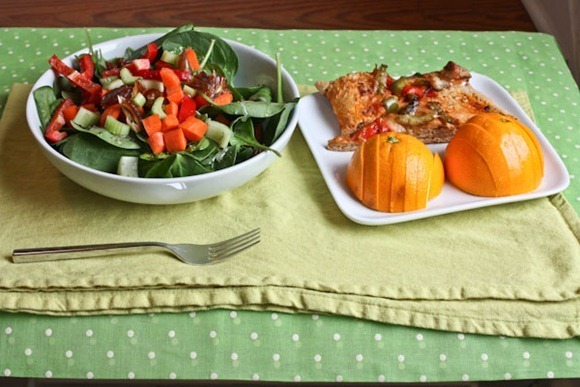 Food looks best when it doesn’t have lots of color or frilly patterns to compete with. You have quite the collection there! Our dishes don’t fit in our cabinets! The cabinets aren’t deep enough. This is the perfect solution!! I only have the billion sets of our everyday china we got for our wedding. I need to branch out. I feel a little weird writing this, but I thought it wouldn’t hurt to reach out to you! 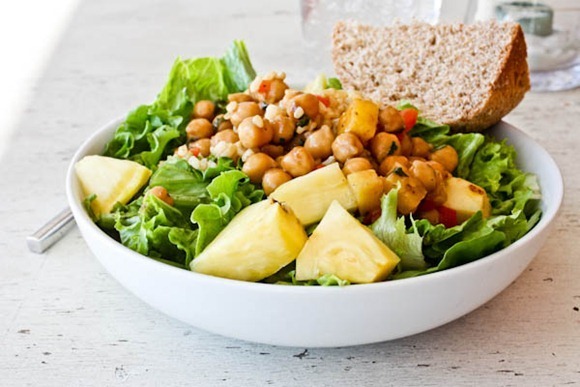 I am a huge huge huge fan of yours, and your blog has been one of the most influential reads that has encouraged me to live a healthier and happier life! Not to mention, I am now totally obsessed with oatmeal and scrumptious sandwiches, thanks to you! 🙂 I recently started my own blog (Happy By Nature), but its personality is still in-the-making. I am a foodie, and would love for it to one day be filled with recipes, but for now, it’s mainly a reflection of my journey to discover delicious eats, good reads, and eco-finds. My role as a photographer is still young in the making, and I realize that so much about food photography is about presentation – having colorful bowls, unique cups and glasses, funky spoons, etc. Your dishes are like eye candy to me! After reading this post, I thought that perhaps, if you ever needed to get rid of any dishes, maybe you could consider donating it/them to me? I am a medical student, living at home, so I can’t really invest in new supplies. Certainly, this is no biggie and obviously not urgent! Just thought I’d ask! Thank you for being you and for sharing your daily eats with us! our blog always makes me hungry! Haha. Do you live in Virginia? I’d be happy to give you leftovers as I clean out my cabinets, but I’m not really willing to ship things – it’s too tricky to package up breakables and they are expensive to ship!